A little-known Qatari sheikh has been thrust into the limelight as a Saudi Arabia-led bloc tries to wring concessions from his nation to end the political feud dividing the Persian Gulf. 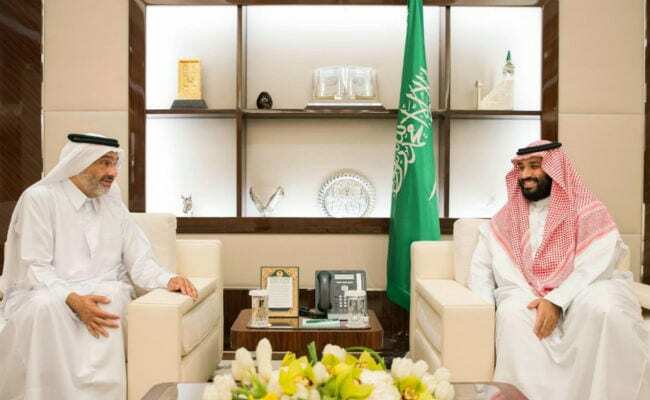 Sheikh Abdullah Bin Ali Al-Thani, a descendant of Qatar's founder, was welcomed warmly in Saudi Arabia by Crown Prince Mohammed bin Salman, then jetted off to Morocco, where Saudi King Salman hosted him at his vacation spot in Tangier. And while the Qatari government said the sheikh was on a personal visit, some media outlets close to the alliance portrayed his meetings as a triumphant diplomatic effort. Sheikh Abdullah said King Salman and his son agreed to open Qatar's only land border, snapped shut on June 5, to allow Muslim pilgrims to travel to the holy city of Mecca. The king even offered to dispatch planes at his own expense to fly in others and set up an operations center under the sheikh's command to help Qataris entangled in the crisis. Saudi Arabia and allies that severed diplomatic and transport links with Qatar in June have denied seeking regime change in Doha, making the emergence and front-page treatment of the sheikh a surprising development. Promoting him is probably part of a plan to add pressure on Qatari ruler Sheikh Tamim Bin Hamad Al Thani, who has refused to capitulate to the bloc's 13 conditions for ending the feud, said Abdulkhaleq Abdulla, a political analyst in the United Arab Emirates. "Saudi Arabia has many pressure tools that it hasn't used until now and this is one of them," Abdulla said, adding that he doesn't believe the alliance is currently pursuing a policy to change the Qatari leadership. Yet should Saudi Arabia decide that is needed, it can mobilize a support network within Qatari society and the ruling family "to spur a palace coup," he said. Al Bayan, a Dubai-owned daily, described Sheikh Abdullah on its front page as "the voice of reason to whom the hearts of Qataris have opened." It also said that he's known for being "widely accepted within the Al Thani family in particular, and Qataris in general." The sheikh is a scion of a ruling family branch that was in power for decades until 1972. His brother, Ahmad, was deposed in 1972 by Sheikh Tamim's grandfather, Saudi-owned Al Arabiya news network said. The sheikh's diplomatic exploits have turned him into an instant social media celebrity. Within three days of joining Twitter, his account has attracted more than 250,000 followers. He gave out contact details of the operations center. Underscoring his reach, he said he also spoke with the Saudi central bank governor, who denied that banks in the kingdom had stopped "giving out Qatari riyals to Qatari citizens." "The king has honored me by accepting my mediation on behalf of my people in Qatar," he wrote. So far, the conflict has resisted other mediation efforts. Kuwait's emir has tried his hand, and Secretary of State Rex Tillerson visited the region last month and later dispatched two envoys to attempt to resolve the dispute. Andreas Krieg, a lecturer in the department of defense studies at King's College in London, said the sheikh is a London-based businessman with commercial interests in the Gulf, but lacks public support that would help propel him to power. His emergence, however, serves as a way of telling Qatari leaders and global powers that the crisis is far from over, he said. "The past couple of weeks we were thinking we will see a de-escalation of the crisis as the Americans were focusing on the Saudis to make some concessions to come to an agreement," Krieg said.